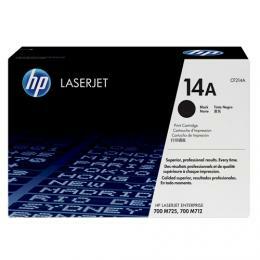 HP 14A, CF214A, HP M712 M712DN M712XH M725Z M725DN M725F Toner is a HP black CF214A cartridge for use in your laser printer. This HP M712 Toner delivers excellent print value. This HP M712DN Toner, HP LaserJet Enterprise 700 toner is a HP black toner cartridge. Compatible with Toner Cartridges: CF214A, CF214X, 14A, 14X.